Without smog injection or injection heads. Must use Trans-Dapt Performance swap mount kit #9736. Not applicable or intended for street or highway use. Legal only for racing vehicles which may never be used upon a highway, check footnotes also. With Hedman's guaranteed fit and lifetime warranty, how can you go wrong with these headers? Most are fabricated from 18-gauge steel with mandrel bent primary tubes and 1/4" flanges; some utilize thicker 14-gauge or 16-gauge tubing with 3/8" flanges. The black paint Hedman applies to uncoated headers is not high-temperature; it is pre-installation protection only. 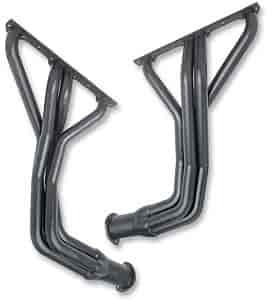 For the ultimate protection from the elements, click the following link to view Hedman's own HTC Hi-Tech Coated Headers.